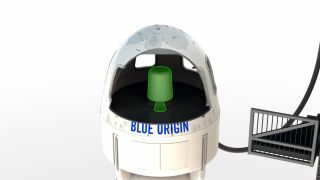 The in-flight escape motor on Blue Origin's New Shepard space capsule will get an in-flight test on Oct. 5, 2016. Blue Origin, the private spaceflight company led by billionaire Amazon.com founder Jeff Bezos, plans to launch a critical safety test of its New Shepard suborbital vehicle today (Oct. 5). If all goes according to plan, the New Shepard capsule will zoom away from its rocket shortly after liftoff from Blue Origin's west Texas test site, showing how it would get passengers to safety in the event of a real-life launch emergency. Blue Origin will webcast the uncrewed test live beginning at 10:50 a.m. EDT (1450 GMT) today at www.blueorigin.com; you can also watch it live here at Space.com, courtesy of Blue Origin. But today's test will be different. "About 45 seconds after liftoff at about 16,000 feet [5,000 meters], we'll intentionally command escape," Bezos wrote in a blog post last month. "Redundant separation systems will sever the crew capsule from the booster at the same time we ignite the escape motor." That escape motor, which is mounted beneath the New Shepard capsule, will burn for 2 seconds, blasting the vehicle hundreds of feet away from the rocket. The capsule will coast for a while and then deploy three "drogue" parachutes near the top of its flight path, Bezos added. The main parachutes will open shortly thereafter, allowing New Shepard to touch down softly. The rocket, which has already flown and landed four times, probably won't be so lucky: The 70,000 lbs. [32,000 kilograms] of force exerted by the capsule's escape motor will knock it off-kilter, making a successful landing unlikely, Bezos wrote. "If the booster does manage to survive this flight — its fifth — we will in fact reward it for its service with a retirement party and put it in a museum," Bezos wrote. "In the more likely event that we end up sacrificing the booster in service of this test, it will still have most of its propellant on board at the time escape is triggered, and its impact with the desert floor will be most impressive."